With the recent election of Barack Obama, there is going to a new Presidential precedence in using the Interwebz to communicate with the US citizens. There was no question Obama’s Internet marketing was top notch. He and his team had the most effective marketing of anyone who ever ran for office. 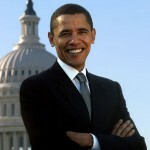 Twitter, Facebook, YouTube, Flickr – Barack Obama’s team has and is participating in all of these new mediums. Even though he will likely have to give up his Blackberry when he gets to the Oval Office, Obama will still be the first president to use a laptop at his desk. Add to that, Obama will now be giving a weekly address via YouTube. This is obviously a HUGE step in the right direction – not since JFK using TV has a president involved himself in new channels of communication. With regards to his technology policy, perhaps what is best about the election of Obama is that he is a strong proponent of Net Neutrality, the purposed laws and measures which will keep the Internet open and free for a long time to come. Obama will even be appointing the first Chief Technology Officer of the US. Hello, change. Check out this video of Arianna Huffington (Editor in Chief of Huffington Post) interviewing Google CEO, Dr. Eric Schmidt about the underlying potential of the new Internet Presidency. Hopefully, the US government will be able to be as increasingly transparent as businesses/corporations have become through the use of social media. Whether you agree with the rest of his policies or not, with Barack Obama in the White House, the Internet wins. I agree entirely with you. The Internet wins indeed. Finally, a president who gets it! And to think, we almost ended up with John McCain, someone who openly admits he’s not capable of opening his own email. If that doesn’t say “out of touch,” than nothing does. Looking forward to seeing how far the prez takes this, but it’s cool none-the-less! Ron Paul did an outstanding job using the internet to his advantage, as well. I think he brought in something like $6 million in one day. Wonderful article — your best yet! Obama certainly seems to be the connected president; hope he is in more ways than one. There’s a lot of talk about how he may have to give up his Blackberry; the downside of having so much power i guess. I knew I was in the right profession, if Obama uses the internet for such a campaign – then I shouldn’t most companies. He’s the Presitech of United States. I agree that Obama had too marketing for this last election and he knew how to use the internet to get more voters out. I agree that Ron Paul did a great job and even managed to get a decent amount of votes being a write-on candidate. I am a straight up Republican, but I have to admit that I like the man. I hope he does a good job of leading our country. He has a big job ahead of him. Monica you’re really funny. Where are you based? Are you into PR or journalism – Loved your blog. Hopefully the new Chief Technology Officer will think and act strategically and tackle some of the underlying structural problems with the Internet such as running out of domain names, online security, fault tolerance etc. In the future I am sure that history books will talk about the development of the Internet as an even greater milestone than the printing press. Its really a very progressive step for a nation.Mr. Obama is no doubt an idol for every nations president. I think it will be interesting to see how Barack will use the Internet after taking office, it’s really help full Wins saves lots of time, a huge merit of Internet is a possibility to download music and films in no time. I think that Barack Obama used what was available to him and didn’t harm anyone by advertising through You Tube. I believe he set a great example on how to save money and keep a tight budget since the unemployment rate is getting lower in the U.S. Previous Previous post: Win A Blog Design Makeover From IZEA and UBD!